Watch Dr. Pranatharthi Chandrasekar present a case study using CRESEMBA for an adult patient with acute myeloid leukemia who develops invasive aspergillosis. *Intent-to-treat (ITT) population includes all randomized patients who received at least 1 dose of study drug. †372 mg of isavuconazonium sulfate is equivalent to 200 mg of isavuconazole. CI=confidence interval; LD=loading dose; MD=maintenance dose; IV=intravenous; PO=by mouth. ‡Neutropenia defined as neutrophil count <500 cells/mm3. 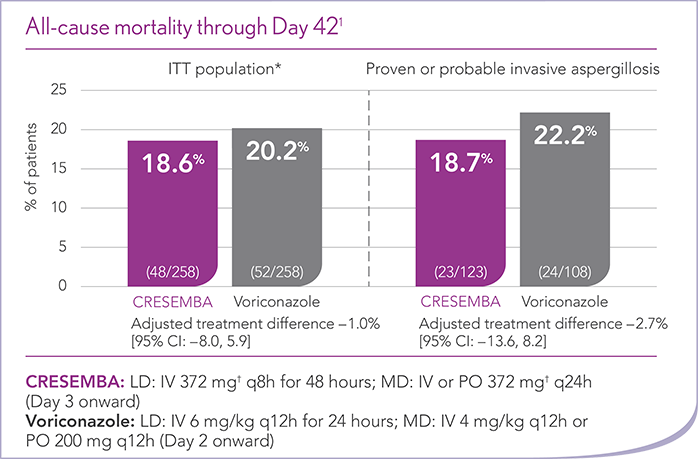 CRESEMBA is the first and only azole FDA approved to treat invasive mucormycosis in adults.